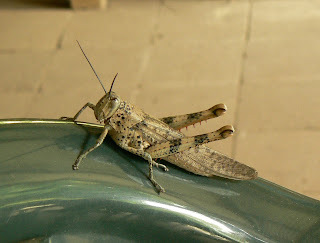 Walking through the shed a few minutes ago I spotted this huge grasshopper on one of the chairs. I wasn't sure what species it was so, having 'Googled', I've discovered it is a Giant, or Hedge Grasshopper (valanga irregularis) which is the largest in Australia. I believe it's a female and she kindly allowed me to measure her against a ruler - 3.5 inches or about 80 mm from nose to tail.